Concept: Launch a timely campaign to kick off the summer season and showcase Good Humor ice cream available at Walmart. Objective: Get consumers excited about Good Humor ice cream; leverage and strengthen their retail partnership with Walmart. 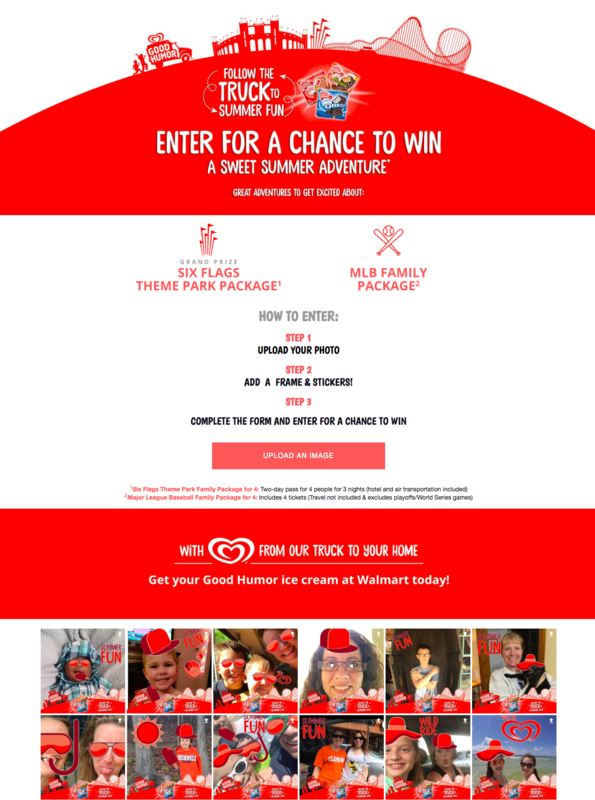 Good Humor is asking their fans to follow the truck this summer for the chance to win a variety of summer-themed prize packages, including a Six Flags Theme Park Package and MLB tickets. Until June 30, fans will be able to enter by uploading a photo of themselves using the Good Humor brand filters, where they will then be entered for the chance to win. Good Humor’s Photo Lab campaign is a great example that shopper marketing campaigns can come in many forms today! Shopper marketing is no longer just coupons and endcap displays (you can read more about that here in our Shopper Marketer eBook), and likewise, brands and retailers are no longer distinct entities. Today, brands and retailers can share both a traditional and a digital space. As part of their latest sweepstakes, Good Humor made the savvy choice to also highlight their retail partnership with Walmart - encouraging consumers to check out Good Humor ice cream available at the mega-retailer. Good Humor’s “Sweet Summer Adventure” sweepstakes’ DCI score is a combination of an Engagement Score (ES) of 370 and Virality Score (VS) of 162. Their campaign is benefiting from easy photo upload capabilities and a timely call-to-action with relevant prizes. Frame your summer campaign. Good Humor used unique frames that consumers could upload over their own photos with messages tied to the campaign’s core messages and content themes, including Good Humor’s brand colors and logo. As we have mentioned before, including branded photo or video frames increases the likelihood that anyone who saw the pictures on social would also then engage with and recognize your brand by either uploading their own photo or liking/sharing a photo, extending the organic reach of your content. Embed a photo gallery on your website. The Good Humor team increased the likelihood that consumers would stay on their page by incorporating a scrolling Photo Gallery of their consumers’ photo submissions, increasing time on site and clicks on the latest submissions. Featuring UGC on your homepage helps to drive traffic, increase conversions and showcase authentic usage of your product/service. Co-creation matters for sharing. Good Humor didn’t need to produce expensive new content or hire actors to promote their sweepstakes, instead, the brand turned to their consumers who are already online creating, sharing and acting as unofficial brand ambassadors every time they snap a photo or upload a video. Learn more about how you can launch your own Photo Lab campaign here.